Rooms, services Take a few-days trip to Czech Republic and enjoy the hospitality of Hotel Galileo Prague. 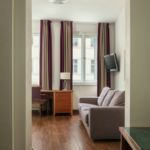 The hotel is offering 57 tastefully furnished rooms to those seeking accommodation in Prague. Your valuables can be the safely secured in the safe. You won't have to worry about the heat, air-conditioners operating in all rooms will take care of a pleasant mood even during the hottest summer days. Free wireless Internet connection (WiFi) is available in the rooms, ensuring that you can stay up-to-date during your holiday. The exact list of services available at Hotel Galileo Prague (including those for an extra fee) and the exact list of equipment in a room can be found on the information sheet below. Location The hotel is located 1.7 km from <objektum 1 neve>, Wenceslas Square 1.7 km and Advent market in Prague 2.3 km. Arrival, opening hours The earliest check-in time to your room is 14:00, the latest check-out time from your room is 12:00.